SUBHEAD: After "secret trip", Gabbard derided as ‘Stooge,’ and praised as ‘Courageous’. Image above: Tulsi Gabbard explaining her journey this week to meet President Assad in Syria. From still frame from CNN video stream. No stranger to the national stage, the Hawaii congresswoman is getting international attention after meeting with Syrian President Assad. 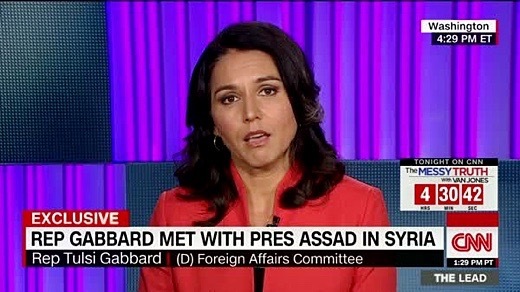 Hawaii Congresswoman Tulsi Gabbard’s secret fact-finding trip to Syria and Lebanon — and especially her meeting with a brutal dictator, Syrian President Bashar Assad — continues to garner attention here and abroad. Gabbard, who serves on the House Foreign Affairs and Armed Services committees, has declined to share many details about the week-long visit to the war-torn nations, which has only added to the mystery and heightened the suspicions of people questioning her motives. On Friday, her office said again that Gabbard would not discuss the trip. In statements, Gabbard has characterized the trip as a peace-making effort aimed at trying to better understand the on-the-ground realities in the region, where horrific violence has caused millions of refugees to flee to Europe and the United States. She said she was surprised by an invitation to meet with Assad, and acted on the opportunity, sharing no further details. Anger And Praise Critics say that a meeting with a member of Congress enhanced Assad’s credibility and that it was naïve, or even treacherous, for her to go there. Gabbard’s trip “raised alarms,” wrote The Guardian, a British news site. “Tulsi Gabbard’s Fascist Escorts to Syria,” was the headline on a piece by The Daily Beast. The Daily Kos called her a “stooge” for the Syrian president, who has killed thousands of dissidents, allegedly including by poison gas. The secret trip angered some of her congressional colleagues, according to The Hill, a political news site. Gabbard, a combat veteran who served in Iraq, has also been praised in some circles for making the trip. A group of Syrians posting on a website called Progressive Democrats of America called the visit “courageous.” A story about the trip on AntiWar.Blog attracted applause from people who oppose U.S. military intervention and high levels of military spending. Syria, once a bastion of multiculturalism and religious tolerance, the home of picturesque and historic antiquities, has become a bloodbath since a civil war erupted in 2011 amid the uprisings known as the Arab Spring. Assad’s regime is backed by Russia. His opponents, who are backed by Saudi Arabia and other Persian Gulf countries, include many Islamic militant groups. Some of the rebels who are viewed as more moderate have received American support. Syrian government forces are also battling the Islamic State on Syrian soil. Former President Barack Obama was a vocal opponent of Assad, and contemplated sending U.S. troops to Syria to help topple his regime. President Donald Trump has endorsed a more hands-off approach to military intervention in the Middle East. His position on Syria is a work in progress, but there have been some suggestions in leaked documents that he plans to step up U.S. involvement there. Gabbard has long opposed U.S. military intervention in Syria, saying that overthrowing Assad would allow Islamic militants to gain control of the country. This isn’t the first time the representative of Hawaii’s 2nd Congressional District has been a lightning rod. She has been at odds with the Democratic Party establishment since she endorsed Sen. Bernie Sanders for president instead of former Secretary of State Hillary Clinton. Gabbard resigned her position as vice-chair of the Democratic National Party to underscore her disapproval of what she said the party had done to undermine Sanders’ candidacy. Gabbard went to Syria during the transition week, as Obama was departing office and Trump was being inaugurated. She said she could not reveal details of her travel plans for security reasons. She did not inform Democratic Party officials she was going, and did not tell the Republican leaders of the Foreign Service or Armed Service committees. She said she did tell the Defense Department she was planning to make the trip, and got approval from the House Ethics Committee. She said she did not inform Trump. “The Trump administration was not aware or involved in the trip in any way, and the congresswoman has not been in touch with them since returning regarding this trip or anything else,” her office said in a statement. Gabbard’s relationship with Trump has also raised eyebrows in Democratic circles. Shortly after he won the election, Gabbard visited him at his New York home in Trump Tower. She said she went to talk about her concerns about military intervention in Syria; some observers speculated she might be looking for a job in his administration. Assad’s military alliance with Russia added to the controversy over Gabbard’s trip. Russia is widely believed to have intervened in the U.S. presidential election by hacking the email of the Democratic National Committee, exposing messages that put Clinton and her supporters in a bad light and undermined her candidacy. Gabbard has said that the trip was sponsored by an organization called the Arab American Community Center for Economic and Social Services, part of an organization known as ACCESS, which says on its website that it is a philanthropic group that assists Arab-Americans. She said was accompanied by former Congressman Dennis Kucinich, a progressive pacifist who ran for president in 2008. Gabbard’s husband, Abraham Williams, also traved with her. He posted video of the trip on Gabbard’s facebook page, which has drawn 102,000 views, 2,640 shares and dozens of comments. Most of them are complimentary, with some urging her to run for president in 2020.